You'll be £8.00 closer to your next £10.00 credit when you purchase Battlefields in Miniature. What's this? Like a good general, a good wargamer should have an eye for the ground. Just as the nature of the battlefield plays a central role in real warfare, so miniature wargames are greatly enhanced by realistic terrain. Besides, when you've spent hundreds of hours collecting and painting your miniature armies, they surely deserve ground worth fighting for. Master terrain modeller Paul Davies takes the reader through the process of creating a visually appealing yet practical terrain system. First the techniques of making the basic landscape are explained, then a series of projects show how this can be adapted to suit different periods or geographic locations (eg European farmland or Sudanese desert). There are then detailed chapters on adding vegetation, buildings, roadways, trench systems etc. The clear, step-by-step instructions are clearly illustrated by numerous specially-taken photographs of the work in progress and Paul's inspirational finished pieces. This is a great book, I would recommend to both wargamer and scale modelers. Though it is more oriented to historical war gaming, it has ideas and techniques suited to futuristic war gaming as well. This book is very interesting and goes a little further than other books in this genre. A very interesting and useful title for the modeller and wargamer when looking for something more when recreating their battles in a table top game or exhibiting their work. This is an inspiring hardback book of nearly 300 pages that introduces the subject of creating practical wargames terrain and scenic structures. The author guides the reader through selecting and using tools before discussing different types of wargames terrain, which have been seen around the UK show circuit in recent years. ... a fascinating look into the world of creating war game terrain... detailed instructions for each project are invaluable... highly recommend this book... well written, excellent book with detailed instructions on a subject usually left to the imagination of the gamer. 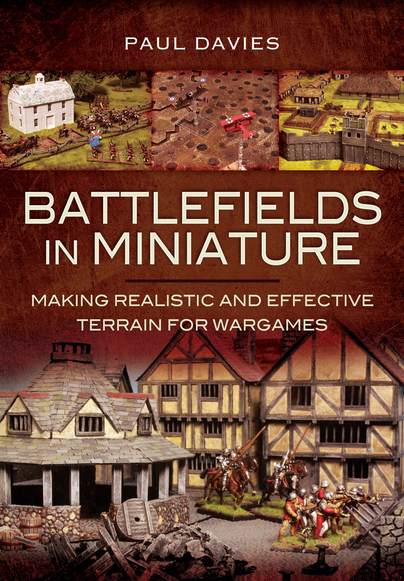 In this 287-page hardback book, wargames terrain modeller Paul Davies, author of numerous magazine articles on the subject, takes the reader through the process of creating a visually appealing yet practical terrain over which miniature battles may be fought. The techniques involved in the making of a basic landscape are explained, such as terrain cloths and tiles, custom or sculpted terrain, and this is followed by a series of projects showing how this can be adapted to suit different periods and/or geographic locations. There are then numerous sections on adding rivers and ponds, islands cliffs and hills, trees, walls, fences and screens, hedges, gates, cultivated fields, roads, bridges, defences and buildings. All these projects have step-by-step instructions and are illustrated with over 400 specially taken colour photos, taking the reader through the various stages of construction to the finished model. There is no doubt that this is a practical and useful guide, both to the specific items which are featured, but also in general construction terms. The book should be well received by wargamers and diorama builders alike. Recommended. Each chapter of the book tackles a specific topic and gives a variety of options available to you with lots of useful hints and tips. Each chapter includes 'projects' to try your hand at, and gives step by step guidance all of which are well illustrated with informative photos throughout... All in all this is a really handy guide to the wide variety of elements to make up a good looking and effective environment for playing wargames and enhancing the visual enjoyment we can all get from the hobby. A valuable reference I think for the wargamer, both new and experienced alike. Paul Davies has been creating models for War-gaming for many years and this book showcases his extraordinary abilities. After reading through this I will never again walk in the countryside without looking around and visualising the possibilities that nature could provide in order to create realistic models and landscapes. Similarly, the little knick knacks throwing around in drawers that are seemingly unimportant can be used to great effect with a little imagination. The office notice board pin, glued to a small piece of card to create a bollard is so simple and blindingly obvious, yet I would never have thought to do so. The author creates anything, from major buildings (using high density foam and balsa wood) to bridges, rivers, ponds, trees, walls, fences, hedges and so on. Little is left uncovered. Shaving a road through a gold fur rug and using decorators mate to create wheel ruts, then the application of the appropriate colour paint simulates a brilliant corn field, the ideas just flow out from the author. Techniques for creating sea landscapes, hills and islands are also inspired and very creative – but not unattainable skills to the less talented. The book is, thankfully, copiously illustrated with many how to photographs, all in colour and each different topic is taken in 'how to' stages. Although the book (as the title suggests) is pertinent to War-gaming, it is just as useful for any model making enthusiast, the principals of creating natural or man-made environments is the just the same but I learnt more from this book than I have from any other model making publication. With a little patience, tenacity and for what can be quite a small outlay, great things can be achieved by any amateur using the excellent Paul Davies as his guide. Highly recommended.